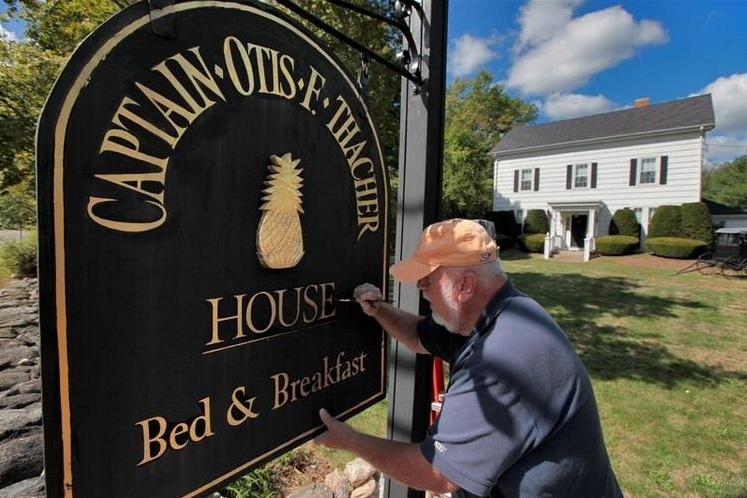 The Captain Otis F. Thacher house is located in North Dartmouth, Massachusetts with convenient access to the Dartmouth mall, numerous stores & restaurants, and The University of Massachusetts at Dartmouth. Our home has a lovely country setting with a duck pond in our backyard. We have lovingly restored this 18th century home combining natural beauty, comfort, convenient access to shops while maintaining peace and seclusion. Come stay with us while you see the attractions in the surrounding areas of Dartmouth, Westport, Newport, Fall River, and New Bedford. The house was built by Captain Otis Thacher. Captain Thacher ran several whaling ships including the Victory and Edmund James out of New Bedford. Dartmouth, Massachusetts is near the border of Rhode Island, about 30 miles east of Providence, and 60 miles south of Boston. Its is convenient by car to Newport, Fall River, Westport, New Bedford and Cape Cod. Ten minutes away, the New Bedford Airport accommodates private and commercial aircraft, offering shuttle service to Boston, New York City, the Cape and the islands of Martha’s Vineyard and Nantucket. The Martha’s Vineyard Steamship Service offers “Fast Ferry” service out of New Bedford to Martha’s Vineyard. Please call us to make a reservation.